You may need to export/import your modules for various reasons. At the beginning of a new term, you’ll want to import your modules from a previous site so you don’t have to re-do all that work over again. You may want to share your files with a colleague. Or you may want to keep a backup copy of your modules. You can export them and save them on your desktop. There are two ways to handle module import/export from one site to another. The first way is to use Import/Export from the Manage area. Another way to import modules into a different site involves Import from Site, found in the Site Info tool. From term-to-term roll-overs, the preferred and faster method is to use Import from Site. To import your modules from one site you own into another site you own, you can use the Import from Site feature. This is the same method you use to import other tools in the system, such as discussions, resources, syllabus, and more. The advantage of this method is that you don’t need to export the modules first. After a short wait while the system is working (be patient), you’ll be returned to the Site Info window. Go to your Modules page and the imported modules will be at the bottom of the list, under any previously existing modules. You can now sort them into place, set their Start and End Dates, delete any you don’t want, etc. Use this export/import method if you want to save a backup file of your modules, or if you want to share them with a colleague. 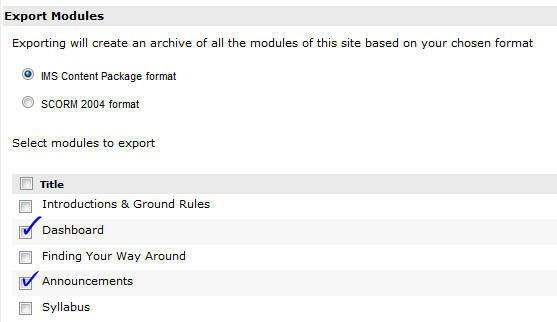 Also if you only want to export a few modules, not all in the site, use this method. This export functionality exports all of your modules and sections into an IMS Content Packaging (CP) zip file that you can import into your next term’s site or other system that supports IMS CP. Click on the Import/Export link at the menu bar in Author view. Note: Choose IMS Content Package format if you want to import into another ETUDES site (NOT SCORM). When you export here, what you are exporting is a ZIPPED folder with your chosen modules in it. Save this zipped folder in a convenient location. This is all you need to import the information into a new place. If you unzip and open the folder, you’ll see several documents plus a folder of resources. Inside that resources folder are all your module/section pages, identified and in html format. It is not recommended that you alter this package. You can save it if you want. You won’t need this unzipped folder or files for import. You can import the zip file into the Modules of another site you own or share it with a colleague if you so desire. Click on the Import/Export link at the menu bar of the Author view. Browse (in the box provided) to find the folder you exported from the other site. Then click on Import. The files will be import and placed at the bottom of the list under any existing modules. Sort them as explained in the Manage Modules section. If there are modules that were imported that you don’t want, you can delete them as explained in the Delete Modules section.